Boot Camp at the 55th Escapade, Pima County Fairgrounds, Tucson, Arizona. We made it through Escapee’s Boot Camp! We are now Graduates! 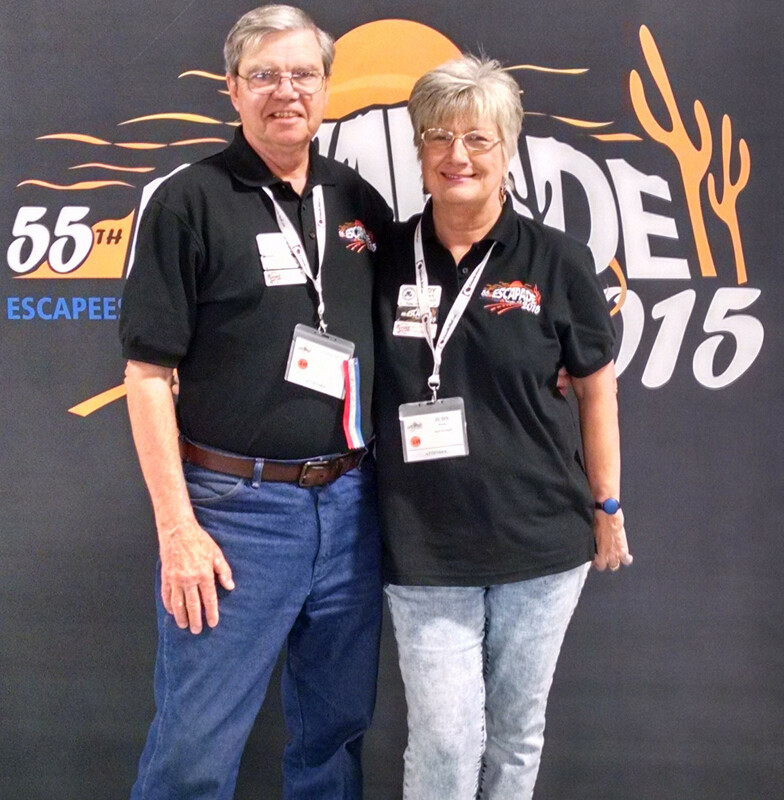 We had 3 full days of informational presentations on the RV Full-Timing Lifestyle to prepare us for our travels and 5 more days of seminars during the 55th Escapade that followed. The attendees ranged from folks like us with some experience to brand new RV owners who needed assistance getting into their pull through parking space and some who were just starting to investigate the lifestyle and looking for a rig. We along with many of the other attendees left with information overload. However, after a day or two for it to soak in and fall into place in our minds, we feel far more confident in our decision to full-time travel. How to choose the type of RV suitable our personal lifestyle and many more topics. These courses were taught by qualified instructors who have RV full-time experience. We were busy from early morning through the day and into the evening. A catered meal at breakfast and dinner made it easy on us who usually also cook. After dinner, there would be an open question and answer session which cleared any misunderstandings of day’s topics presentations. When asked by others at the following Escapade Rally, “What did we learn”? It is a difficult question to answer. We had gained some knowledge of RVing over the past 3 years being part-time travelers and we have been on the road fulltime nearly a year. We knew a lot of the basics by traveling with our RV Club in our little tow trailer for a couple of years on monthly RV Camp-outs. The experienced campers in the club were helpful with tips and tricks to get us going. So, we felt that we knew the basics on what to do and not to do. This class filled in the blanks in-between what we knew and what we needed to know. We also found that there was a lot of information that we did not know correctly. One important topic covered was Tire Safety. We learned through experience that a tire will likely age out of being safe to use before it may wear out and that surface or tread appearance can be deceiving. We wish that we had known that earlier in our travels. Our classmates are fortunate to know it now. We looked for our “Aha!” moment of that one thing that made a difference and could not narrow it down to one thing. We came to the conclusion that we will find it and many more things that we learned along our way of travels. Perhaps when something major doesn’t go wrong because we were proactive and preventative in our maintenance or when something does go wrong and we will now know how to handle the situation. We will not despair or give up a lifestyle that we enjoy just because we hit a bump in the road. Having boot camp under our belts, we have enjoyed various Escapade’s welcoming socials; an ice cream social, a full night of delightful entertainment and the Opening Ceremony for the 55th Anniversary Escapade Rally, where we had the honor to hear Kay Peterson, the Co-Founder of Escapees speak. The Rally is just getting started! Tomorrow and the rest of the week, we split up to attend separate seminars on the Rving Lifestyle: Travel guides, Technical Communication Equipment, Finances on the road, Arts and Crafts, Writing and Photography topics and more. Even going to separate classes, we will not get it all covered. Fortunately, they mix up the seminars with fun times as well. Lots of attendees to the various functions. Gurus like Cherie Ve Ard and Chris Dunphy had packed classes. We all want to be tech savvy on the road. We acted like groupies in the presence of so many fantastic Presenter’s from the RV Blogs that we have been reading for a few years. They encouraged us by their own stories of the Full-Time life on the road. We took a preliminary stroll through the vendor and BOF (Birds of a Feather organizations and SKP Parks) areas and plan to return for shopping the many “new” and “must have” products and learning about the organizational memberships. The evenings were filled with fun and light hearted activities to mix and mingle with other like-minded Rvers. We ate chili at the Chili Cook-off, watched the Doggie Parade, viewed the night sky while a professional sky guide pointed out Constellations, attended a Review with talented Escapees showing off their musical talents, and tonight we danced the night away at the Farewell Party. We found gadgets that we couldn’t leave without and more things that we will put on the wish list for later. I think that the best thing that we left with were the stories and good wishes of the experienced Full-timers and their positive Escapee’s attitude that “Caring is Sharing”. This is a nice organization in which to belong! We know that this is our first Escapade, but it will not be our last!